Saigon (40 Dong Khoi St). white roses and crab wontons. rides again; getting clothes made in Hoi An. in a verbal blowout with a taxi driver in Hanoi. 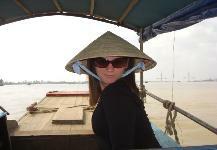 Best Moment: Getting some incredible clothes made in Hoi An with Elisa. Sad but true. Craziest Moment: For sure this has to be our taxi ride from the airport to the Old Quarter in Hanoi. frustration, yelling and getting other Vietnamese people in on the situation. Smells: Fish sauce factories; burning of garbage. Sounds: Horns of motorbikes; Christmas music (yay!). many tailors in Hoi An; Ho Chi Minh's mausoleum; the water puppet show. a small piece of art on lacquer; set of three lacquer bowls. .
Street Food: Pho; banh; fruit. Louis Vuitton, etc in Saigon. even have an idea of crossing into another country in between visiting north and south Vietnam. Type of currency? Vietnamese Dong. About 16,000 dong are equivalent to $1 US. do get a bit more expensive in Saigon. Religion: A combination of Buddhism, Taoism and Confucianism. 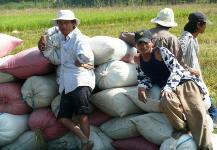 Locals on the side of the highway. 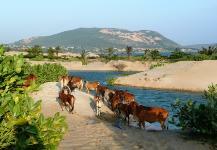 Beautiful Vietnam scenery near Mui Ne.